It's time for summer reading! In this -- the last RIF RAP of the 2015-2016 academic year -- RIF of NOVA co-presidents Nancy King and Justina Johnson Head share a few RIF of NOVA highlights and achievements of the year! 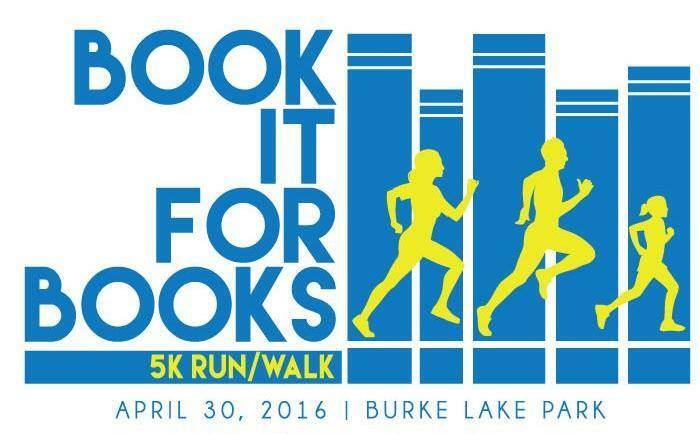 *** RIF of NOVA held its first-ever 5K Run/1-mile fun run/walk "Book it for Books" on April 30 at Burke Lake Park. Thanks to our sponsors and our runners and walkers, RIF of NOVA was able to raise just over $20,000! 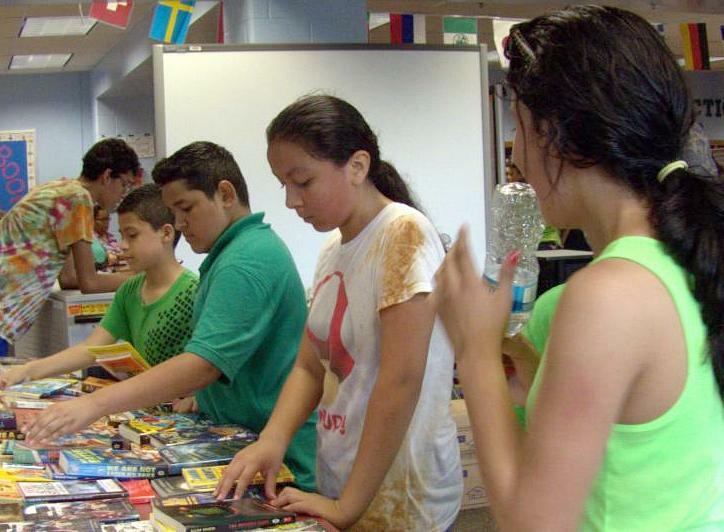 That's a WOW that helps to make up for federal budget cuts and keeps putting books into the hands of underserved children in the city of Alexandria and in Arlington, Fairfax, and Prince William counties! For more about the race and a complete list of Book it for Books sponsors, please click here and here! *** The RIF RAP newsletter is new this year! The newsletter goes to a growing list of educators, sponsors, donors, and friends now numbering close to 600 people! Share the RAP and sign up here! See the year's past RAPs here! *** RIF of NOVA's Do More 24 campaign raised just under $4,000, topping last year's stats by more than a thousand dollars and getting us closer to our goal of providing two books for every child in our 39 schools and centers! Added this year, a random drawing featuring gift cards from several oh-so-generous vendors! Details below! *** RIF of NOVA supporters can now shop online via Amazon Smile and ShopOnlineandHelp! Shop at smile.amazon.com and type in Reading Is Fundamental of Northern Virginia, Inc. to select us as the charity you want to support. Amazon will donate 0.5% of your eligible purchases to RIF of NOVA. Go to ShopOnlineAndHelp.com and buy from Macy's, Target, Walmart, Amazon, Best Buy, and more...and up to SEVEN PERCENT of your purchase will be donated to RIF of NOVA. *** Donors can now donate directly via Paypal on the RIF of NOVA website www.rifnova.org . Easy peasy, lemon squeezy! *** The RIF of NOVA Facebook page is active and updated several times a week! Check it out! Like us and share the news! How will you keep the kids in your life learning this summer? Check out national RIF's blog for tips and ideas that will make summer learning fun! Learn more about RIF's program Read for Success -- a new effort to stop the summer learning slide! Why is this important? Check it out! 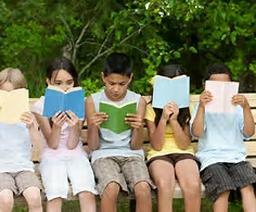 A few summer reading lists for the areas served by RIF of NOVA are linked here! 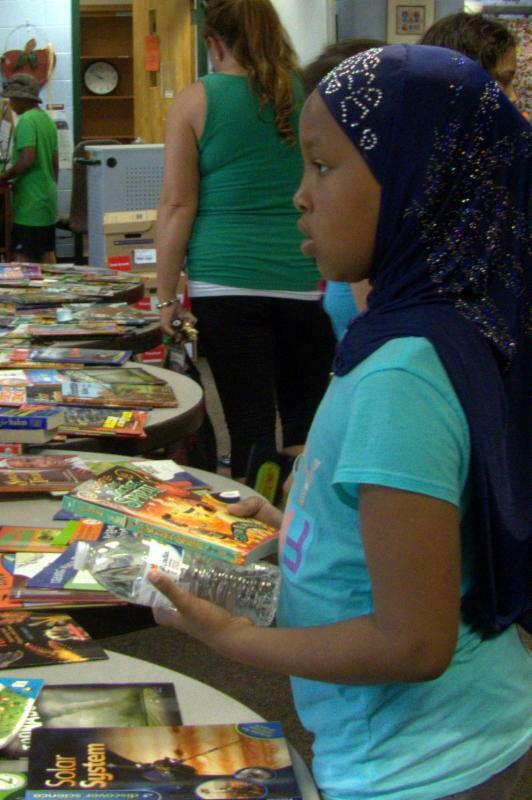 Cora Kelly Elementary School in Alexandria held its final book distribution of the year with the theme: Summer Reading! The children rotated through several activity stations in the gym, heard from the Alexandria City librarian about the library's summer reading program, and then picked out a RIF of NOVA book of their very own! Check out the happy faces! 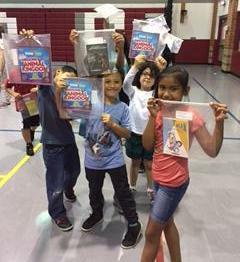 At Lynbrook Elementary School, teachers and students were thinking about summer reading, too, as the children picked out RIF of NOVA books during Field Day! The library was decked out as an Olympic Stadium with pictures of cheering fans along the walls and flags from around the world hanging from the ceiling. In between games races and games, the 5th and 6th grade students were able to choose two books to take home for their summer reading. Hooray! RIF of NOVA liaison and librarian Julie Brannan, physical education teacher Amanda Cioffi, and assistant principal Erika Aspuria brought magic with them as "Team Lynbrook" participated in the inaugural Book it for Books 5K/1-mile race. 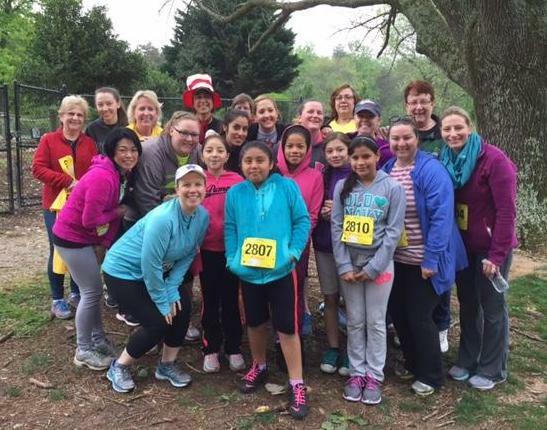 This Springfield (Fairfax) elementary school supported the race in a big way, with 20 runners and walkers made up of administrators, teachers, reading specialists, and student runners! The school set the gold standard for its magnificent effort and for being a role model for other RIF of NOVA schools. Yay, Team Lynbrook! A well-deserved award! Thank you! "Team Lynbrook" on Book it for Books race day! RIF board member Liz Promen gives liaison Julie Brannan the Special Commendation Award! 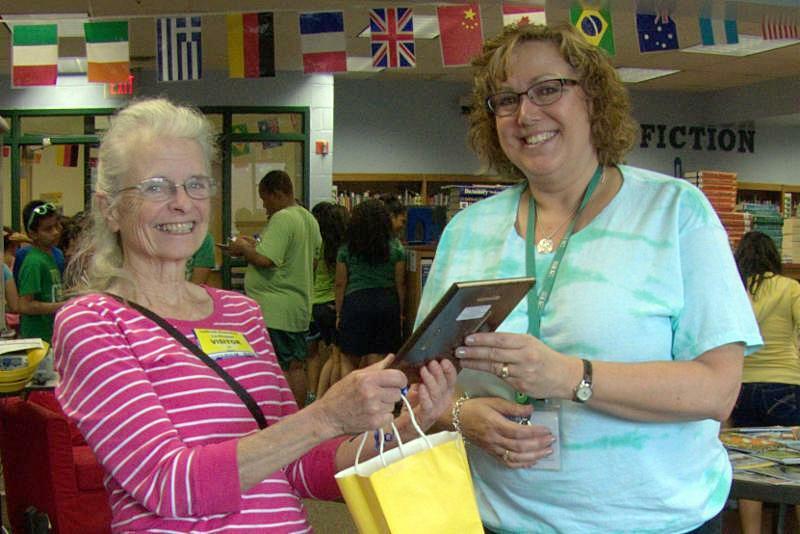 Gloria Johnson (right), RIF of NOVA board member and Arlington area chair, gets a book basket and plaque from board member Glenna Orr (left). 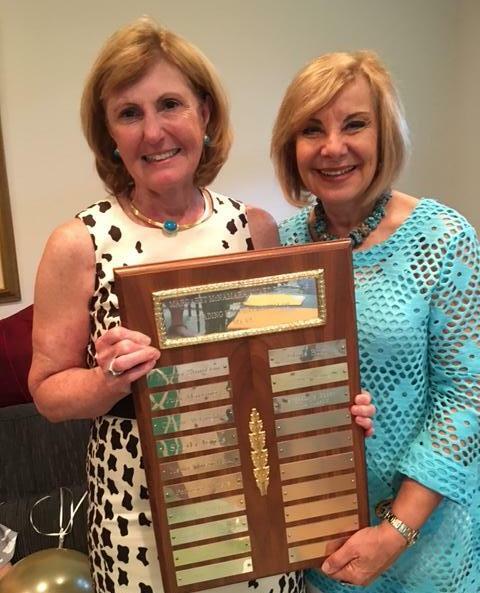 Gloria won the " Jerry Shelton Award" which recognizes long-time, continuous active service to RIF of NOVA. The award was established last year in Jerry's memory for his dedicated support of RIF of NOVA. Few people embody this like Gloria, who has been on the RIF of NOVA board for almost 35 years! Thank you and...go Gloria! The McNamara Award is given each year for outstanding leadership and accomplishment of and for RIF of NOVA. The award honors the founder of the national RIF organization Margaret McNamara. 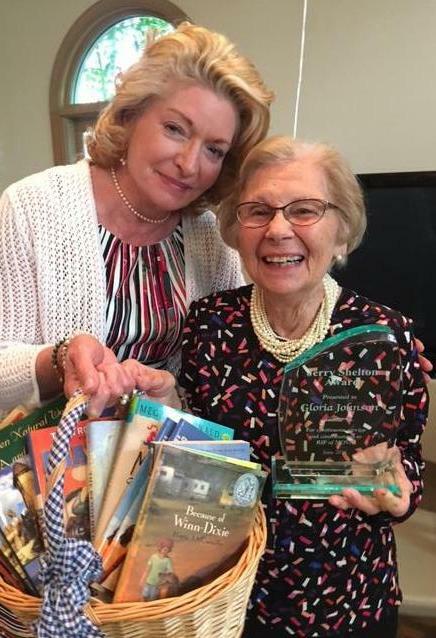 The 2016 McNamara Award was given to board member Mia Mason (left) and board advisory board member Stephanie Berry (not pictured) for their successful launch of the Book it for Books race. Awards chair Sheryl Leeds is pictured on the right. Way to go and thank you, Mia and Stephanie! You rock! As noted above, RIF of NOVA's 2016 Do More 24 campaign was a wonderful success. This year's campaign featured gift cards donated by a number of vendors in the region and given to RIF of NOVA Do More 24 donors through a random drawing. Seth Michaels, Jesse Stanchak, and Lori Wood will be picking up a few yummies at Safeway, Giant, and The Italian Store! Rebecca Tuong, Christy and Jim Prietsch, Debby McHail, Eugene Tillman, and Belinda Collins will be dining at Pork Barrel Barbeque/Holy Cow!/The Sushi Bar, La Madeleine, Dishes of India, and Clyde's at Mark Center. Betty Van Etten, Marie Cavanaugh, LaVera Leonard, Karen Forman, and Miriam Carter will be buying hammers at The Home Depot. Donna Infeld will be adding to her garden at the Merrifield Garden Center. Norah Moseley will be getting some clothes pressed at Presto Valet of Virginia, Inc. Lois Jacobs will be getting healthy at The Vitamin Shoppe. 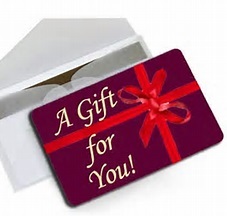 Barbara Pelletier, Nora Sheehan, Linda Goldberg, and Connie Dineen will be sitting pretty at American Beauty at Valentino's, Massage Envy Burke, and The Women's Club. Anne Santorelli will be taking 12 special children to a "Storytime Party" at Hooray for Books! Marie Minton and Satwant Bell will be prettying up their cars and themselves at David's II Car Wash & Detail Center and at Hair by Noelle and Alexandre de Paris! Thanks to all the vendors who donated gift cards to RIF of NOVA, and thanks again to all who contributed during the Do More 24 campaign. Congratulations to all who won a gift card in our random Do More gift card drawing! 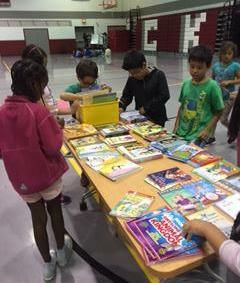 You made a lot of underserved kids very happy with books of their very own!!!! The RAP will be back in August! Have a great summer of reading, reading, reading! In between, please share the RAP! Forward our newsletter to your friends and anyone interested in providing books to children who need them! Subscribe here!